IMT TACCHELLA has recently supplied two TACCHELLA Proflex and four TACCHELLA Multitech grinding machines to the Canadian based company LINAMAR for the complete grinding of Input and Output Shafts. An investment highlighting the productivity and versatility of the machines and the first-class processing results. A further reinforcement of IMT TACCHELLA’s specialization in the automotive industry. IMT Tacchella’s prestigious customer list now includes an internationally renowned company, Linamar, one of the world leaders for the manufacturing of complete transmission modules for the automotive industry. Thanks to the operational flexibility of IMT Tacchella grinding machines, the company has been fulfilling the needs of the automotive sector –where reliability and technology evolution are crucial success factors. 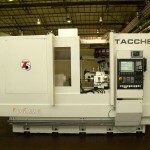 With TACCHELLA Proflex and TACCHELLA Multitech, IMT Tacchella is at the cutting edge of CNC cylindrical grinding; for this reason, the use of their grinders for gear-box shafts is wide-spread by well-known automotive companies and the supply sector. and internal diameters – it embodies the core concept of flexible production and it’s the appropriate reply to the market where the current trend is towards reconfigurable installations, with several grinding operations on one machine. treatment, for “hard” turning, for milling revolution bodies, for boring and for fine finishing. Founded in the late sixties in Canada, Ontario, as a small company of mechanical manufacturing, LINAMAR has evolved into an organisation with 12,000 employees and 37 production facilities based in America, Europe and Asia for the design and manufacturing of transmission systems supplied to the major automotive companies, for passenger and Heady Duty vehicles. The high target of its products prompts the Canadian company to keep its manufacturing technology constantly up to date. An instance of this is demonstrated by the New Laredo facility where components of the new dual clutch gear-box are manufactured. 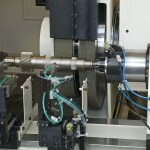 To select the supplier, some specific requirements had been set by LINAMAR: the grinding of all the diameters and grooves on Input and Output Shaft in one single workpiece set-up between centres – in order to eliminate all geometric faults of repositioning and the application of the CBN high speed technology combining high levels in finishing and output. These very stringent requirements drastically reduced the group of manufactures being invited to bid: LINAMAR management was convinced to adopt IMT Tacchella solution because of its technological prominence. 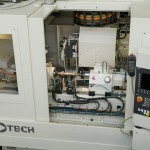 The high-speed CBN grinding of three shafts of the dual-clutch gear-box was a LINAMAR challenge that IMT Tacchella has faced up, with the design and manufacturing of six grinders: two Proflex 3 for the machining of Inner Input Shaft, two TACCHELLA Multitech for the Output Shaft 1 and two TACCHELLA Multitech for the Output Shaft 2. The need to guarantee increased production rates has pushed the manufacturer to conceive a line of machines, each of them devoted to the complete grinding, in one single set-up, of one work-piece type. Choosing specific CBN wheels has drastically decreased cycle times. The TACCHELLA Proflex 3model resorts to ceramic CBN wheels laid out in “R/L/I” configuration, namely the turret on step-less B Axis is fitted with 1 special internal motor-spindle and 2 coaxial spindles, each one with 1 wheel for external grinding, on the right and on the left respectively. Both spindles for external grinding generate a power of 37 kW, the internal motor-spindle a power of 37 kW with a speed of max 12.000 RpM. The set of tools is made up of 1 right-hand wheel pack diameter 450mm, total width 115mm, 1 left-hand wheel pack diameter 450mm, total width 85mm and 1 wheel diameter 200mm and 15mm thick. On the TACCHELLA Multi-tech both ceramic and galvanic CBN tools are applied in “LS & R/R” configuration, that is on 2 wheel-head units for external grinding: on the first unit there’s 1 single left-hand wheel in fixed straight position, the second wheel-head is a turret on a step-less B Axis with 2 spindles, each bearing a wheel on the right-hand. Each wheel spindle generates a power of 37 kW. The set of tools is made up of 1 galvanic CBN wheel, diameter 450mm and max width 190mm, mounted on the first wheel-head unit and of 2 ceramic CBN wheel packs, diameter 450mm and max width 130mm, mounted on the second wheel-head. 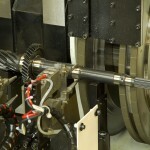 On both machine models the Work-head – specially devised for CBN applications – features a speed ranging from 10 to 5.500 RpM, with 38 Nm available spindle Torque. The rotation of work-pieces is started by the friction produced between the special sintered carbide point centres and the work-piece centres. There’s no need of any additional driving system. Thanks to these configurations the complete grinding of Input and the Output Shaft is carried out in a sequence of just three plunges, within highly performing cycle times.